Have you ever found your finances in a mess because you forgot to deduct something from your checking account? Wouldn’t it be nice to have a special place you could keep track of your income, where it is going and what is left after everything is said and done? We all need to have a single document that lets us keep track of income, expenses and then what we have on the disposable income side. With life comes unexpected surprises along the way, and when we have an expense that we aren’t necessarily prepared for we can go into panic mode. There is plenty of software out there that wants you to pay a ridiculous price for it just so that you have access to spreadsheets. Well look no further because you have found the free Excel templates to help you with your finances! 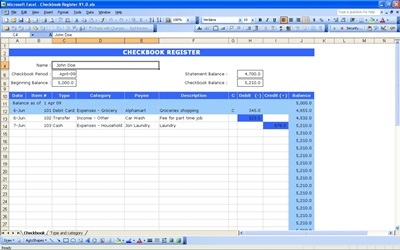 This is an electronic checkbook register and all you have to do is plug in your expenses along with the amounts and it will calculate everything for you. The formulas are already programmed in so you will not have to figure out how to subtract or add your items to find out your balance. If you have something new that arises, simply add it in and the computer will take care of the rest for you. As you can see, technology is growing and so are the different ways to keep up on your income and spending. Plus, with this software being free what better way to try something new out and decide for yourself if you like it or not? So, what are you waiting for? Download the newest way to track your expenses today.